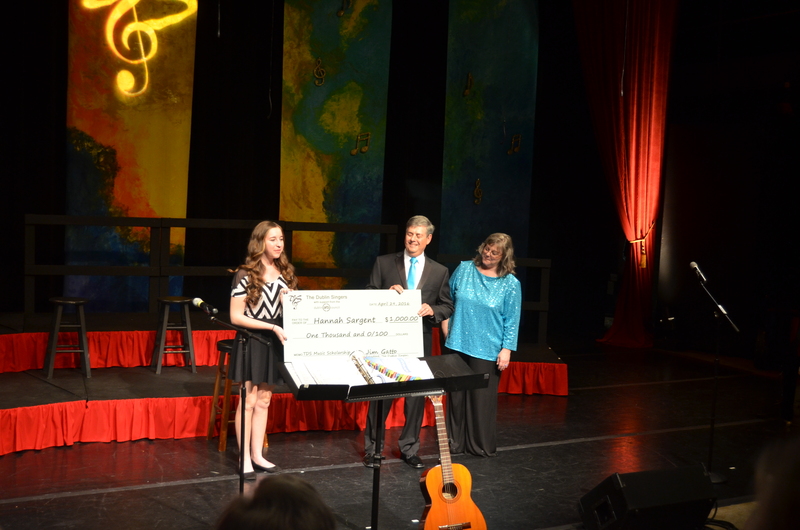 The Dublin Singers, with support from the Dublin Arts Council, are pleased to announce the winner of the annual Music Scholarship: Hannah Sargent. Sargent is a senior at Dublin Scioto High School, and plans to attend Ohio University, where she was accepted into the school of music for music education. She has been a member of the marching band, orchestra and choir at Scioto, and has been a viola player since starting the 5th grade strings program offered by Dublin City Schools. Sargent also plays flute, piccolo and cello and has served as a member of the color guard. In addition, Hannah is member of Irish Fiddle Fetish – a strings group- and travelled to Ireland to accompany a band in their new music video. The Dublin Singers held their 20th Annual Spring Show, “The Best Is Yet To Come!” on Friday, Saturday and Sunday April 29, 30 and May 1 at the Abbey Theater in the Dublin Community Recreation Center which showcased the Singers favorite numbers from years past, such as “The Armed Forces Salute”, “The Beat Goes On!” and “Zip A Dee Doo Dah”. 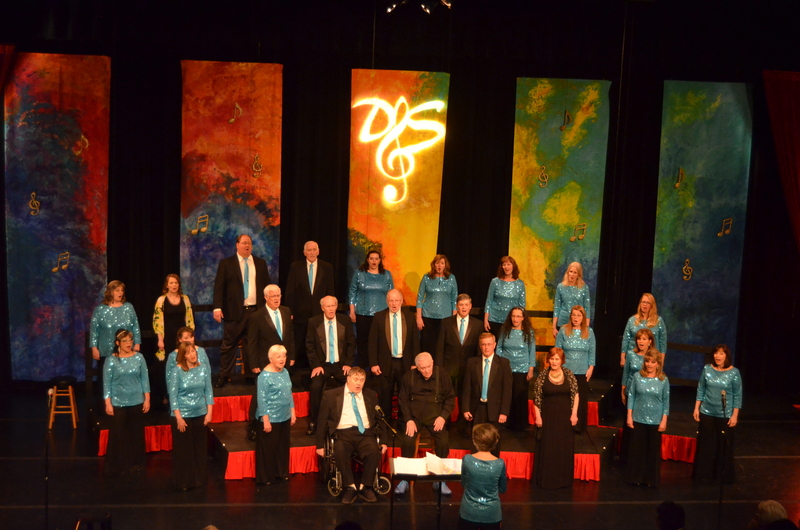 They reprised two numbers from local artists, Carter and Beall, one of which was commissioned by The Dublin Singers for their tenth anniversary: “Psalm Twenty and Three”. The group had fun with “Best Day of My Life” and a selection from Joseph and the Amazing Technicolor Dreamcoat. The Dublin Singers was founded by Mary Fran Cassidy with the support of The Dublin Arts Council in the fall of 1996. The group has been a constant presence in Dublin, Ohio since, promoting their core values of “Community, Musicianship and Excellence”. The group started annual performances with a show called “Dublin Singer Sampler” in the spring of 1997 and since then, the Singers have performed two concerts a year, and have participated in many community events, such as Dublin Kiwanis Frog Jump, the Dublin Christmas Tree Lighting, and Dublin St. Patrick’s Day and Independence Day parades. In addition, the group has performed at the Columbus Arts Festival, the Dublin Irish Festival and Carnegie Hall in NYC. The Abbey Theater was rocking! We hope you’ll join us next year. 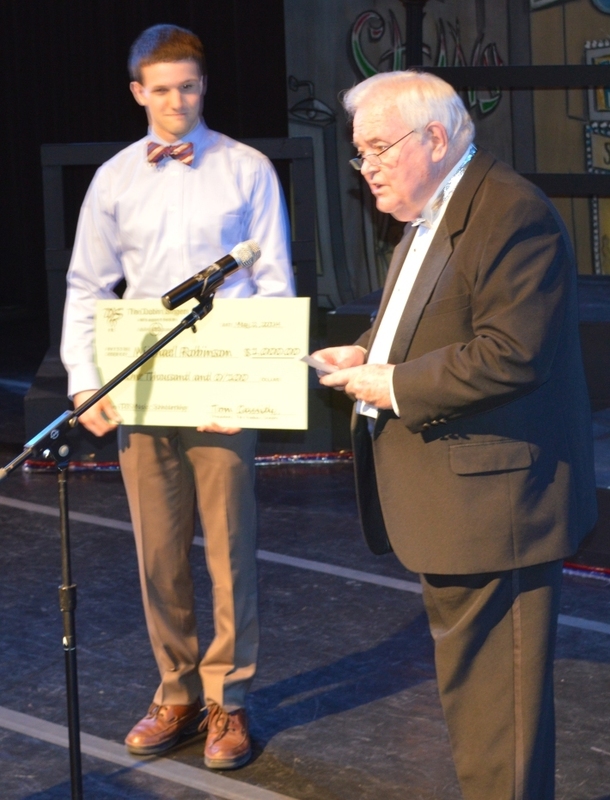 Michael Robinson, a senior at Dublin Jerome High School, is this year’s winner of the Dublin Singers music scholarship. 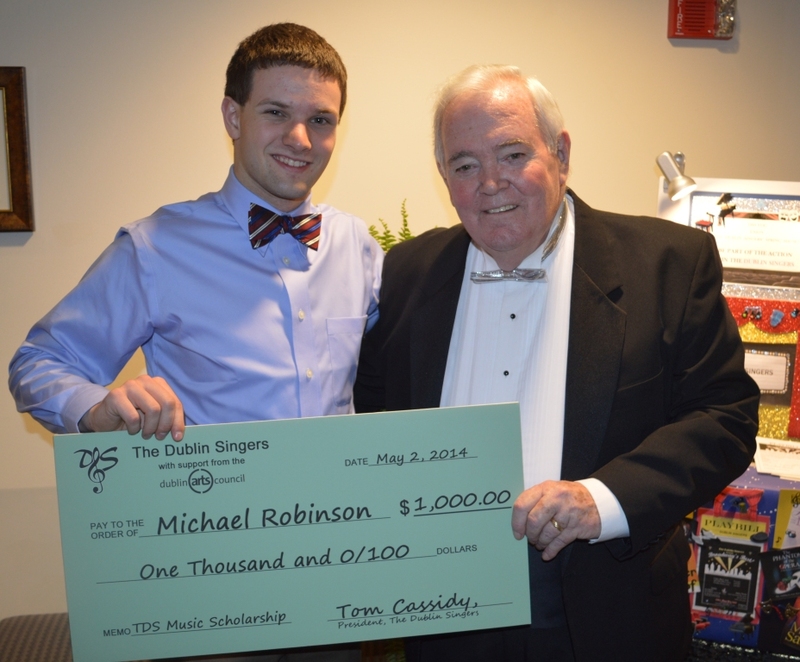 Tom Cassidy, President of The Dublin Singers, presented the award to Michael at the Spring show. We wish Michael all the best in his college and professional career. The Dublin Singers, with a vision and desire to further the art of Music, have established an annual scholarship to be awarded to a music major from the greater Dublin area. Who: Recipient must be a declared music major who lives in the greater Dublin area and is a senior at one of the following high schools: Dublin Coffman, Dublin Jerome, Dublin Scioto, Hilliard Darby, Hilliard Davidson, Hilliard Bradley, Olentangy Liberty, Bishop Watterson, St. Charles or Columbus School For Girls. When: The application deadline is March 30, 2016. April 29-30 & May 1, 2016.